Celtic engagement rings are a highly symbolic, romantic design that many couples choose because of their intricacy and uniqueness. However, with all the lovely designs out there, it can be difficult to know which one to choose. In this exclusive interview, Steven Forsyth of Celtic Wedding Rings shares his insights about the popularity of these designs and how couples can select the best ring for their relationship. Why Choose a Celtic Ring? LoveToKnow (LTK): There are so many amazing engagement rings on the market today, as well as the option of having a ring custom made. With all these choices, what do you feel influences a couple to choose a Celtic engagement ring? Steven Forsyth (SF): A wedding ring is a symbol; that's its primary purpose. 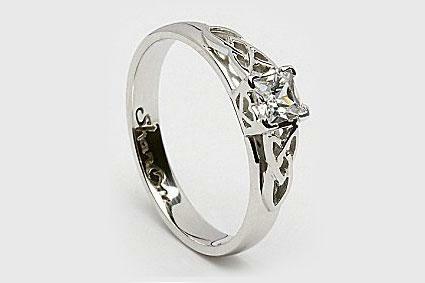 Celtic wedding rings allow people to express so much more than they can with a readily available design. The designs are unique and offer heritage, culture, history, and symbolism in a way no other ring can. 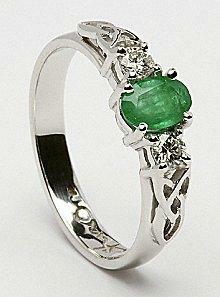 LTK: Celtic engagement rings seem more popular than ever before. Has the demand for these rings grown in recent years? SF: Demand has increased substantially in the last few years, as people become more accustomed to buying over the Internet and new markets are opening all over the world all the time. Online sales have increased for most companies selling on the web, and our industry is no different. LTK: You mentioned that you're noticing new markets for Celtic rings. Where would you estimate these rings to be most popular? Where has the demand been increasing? SF: The US remains the biggest market, but other countries are improving all the time. Examples of markets with the biggest growth would include places such as the UK, Canada, Australia, Germany, and Japan. LTK: With this increase in popularity, many Celtic ring companies have been able to expand the range of ring designs they offer for sale. How have designs changed in recent years? SF: The traditional Celtic designs still remain the most popular, although contemporary designs are becoming more sought after. This is especially true for contemporary takes on claddagh designs. The basic design elements remain the same, so the challenge for designers is to incorporate those elements without compromising their own designs. LTK: Celtic engagement rings can feature diamonds, but there also seems to be a trend toward colored gems. Which types of gemstones are the most popular in these engagement rings? SF: In our engagement ring section we sell more diamond rings than any other stone. However, emeralds alongside diamonds on the three stone rings are also very popular. LTK: With all the amazing design options, it's easy for a couple to feel overwhelmed. What would you say is the most important thing to consider when choosing a Celtic engagement ring? SF: Symbolism. 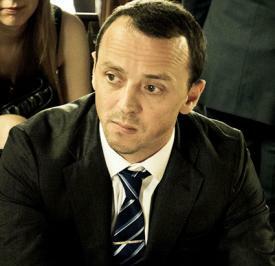 It's the purpose of the ring. It's got to be something that encompasses your feelings, emotions, and what you as an individual wish to express with the ring. Obviously, the design is an important aspect of this, and ensuring you are happy with the design is also of paramount importance. After all, you'll be looking at this ring for a lifetime! LTK: Because of their ornate designs and customization options, purchasing a Celtic ring is a bit different from buying a stock engagement ring. How long does it take for the artisans at your company to craft a ring? SF: Creating a ring can take up to 18 business days. As we do not carry any stock, every ring is made to order. We design, cast, and then hallmark all our jewelry in the Dublin Assays office. Once ready, we then ship via FedEx two day delivery. LTK: After a couple has purchased a ring, are there any special steps they should take to keep it looking beautiful? SF: Gold and silver rings are prone to scratches; it's in the nature of the metal. This means it's a good idea to keep your rings separate from other jewelry when not wearing them, preferably in a lined box or pouch. If your ring has gemstones set in it, check the prongs frequently to ensure they are okay. Finally, wash your ring. You want it to look its best, so use a worn out toothbrush and some household detergent to wash your ring when it's in need of it. Ultimately, many couples choose Celtic rings because these designs symbolize their feelings. The handcrafted nature of these rings, as well as the individual options available, make them a very personal choice for an engagement ring.